It can be easy to take the roof on your home for granted. More often than not, it’s out of site and out of mind. Unfortunately, neglecting your roof for too long can have some dire consequences for your home. That’s why it’s worth treating your roof to a little TLC now and then. One of the easiest and most effective things you can do to protect the integrity of your roof is have to have it cleaned periodically. 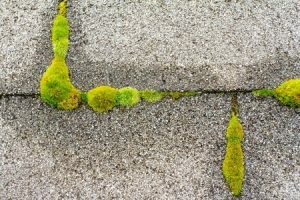 Algae, moss and lichen growth isn’t just unsightly on a roof; it can shorten the lifespan of your shingles as well. When plant life grows on your roof, it’s effectively feeds on the organic material in shingles. Over time, this can significantly degrade the shingles and reduce their ability to prevent leaks and keep your home sealed against the elements. Shingles are designed to reflect heat and sunlight, rather than absorb it. This helps to keep the temperature inside your home in a relative state of equilibrium. When shingles become covered in debris and organic material, your roof begins to absorb and retain heat instead. This can cause your energy bills to get more expensive in the summer, and put additional strain on your HVAC system. Heat isn’t the only thing that a dirty roof will retain. All that moss and debris can hold a lot of moisture as well. If left unchecked, all that residual moisture can penetrate your roof decking and cause it to rot. This can also contribute to mold and mildew growth in your attic. A clean, well-maintained roof is less likely to incur damage and require costly repairs or replacement. By investing a little bit in cleaning each year, you can save a lot of money in the long run. Keeping your roof clean can also prolong the effectiveness of the warranty you got on your shingles when it was installed. Here at Jun’s Pro Services, we have the tools and experience to clean your roof thoroughly and safely. Get your free estimate online, or give us a call today for more information.